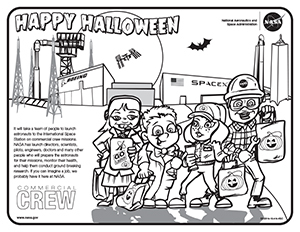 Get Your Scare On With New Commercial Crew Coloring Sheet! Celebrate Halloween with our new coloring sheet featuring kids dressed up as members of the NASA Commercial Crew team! Boeing’s CST-100 Starliner and the SpaceX Crew Dragon are highlighted on their launch pads in Florida getting ready to carry astronauts to the International Space Station passing overhead. To get started, print out the coloring sheet linked here and start filling it in. Happy Halloween! Author Steven SiceloffPosted on October 30, 2015 Categories Boeing, Commercial Spaceflight, General, International Space Station, Kennedy Space Center, NASA, SpaceXLeave a comment on Get Your Scare On With New Commercial Crew Coloring Sheet! Astronauts Scott Kelly and Kjell Lindgren wrapped up a number of tasks on the International Space Station during a 7-hour and 16-minute spacewalk. Each making the first spacewalks of their careers, Kelly and Lindgren climbed around the outside of the station as it orbited above Earth. They carried out several tasks including placing a thermal cover over the Alpha Magnetic Spectrometer and lubricating the station’s robotic arm. They also began to rig power and data system cables for the future installation of a docking port to the station that will be used for the arrival of the Boeing CST-100 Starliner and SpaceX Crew Dragon spacecraft. Boeing and SpaceX are building a new generation of human-rated vehicles that can carry four astronauts at a time to the orbiting laboratory for NASA’s Commercial Crew Program. They will dock at the station and remain in place during their missions before bringing their crews back to Earth. International Space Station astronauts Scott Kelly and Kjell Lindgren will don spacesuits and traverse the outside of the orbiting laboratory’s structure on Wednesday during a spacewalk that will take six-and-a-half hours and cover a number of important tasks. 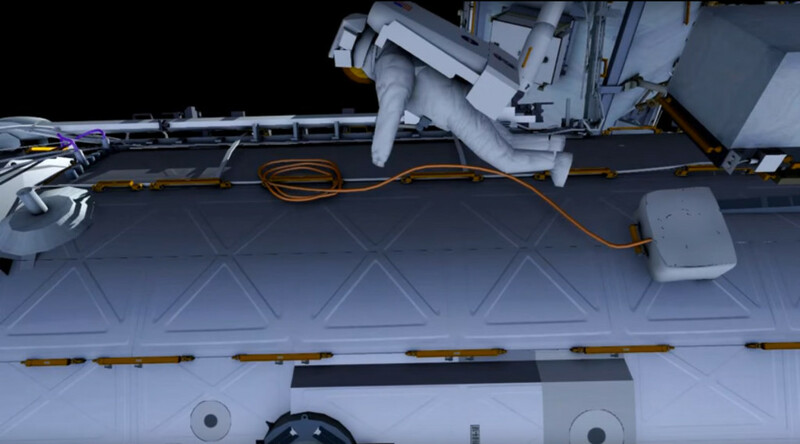 The two, each making the first spacewalks of their careers, will connect power system cables on the station so spacecraft from NASA partners Boeing and SpaceX can dock with the station during flights for the Commercial Crew Program. 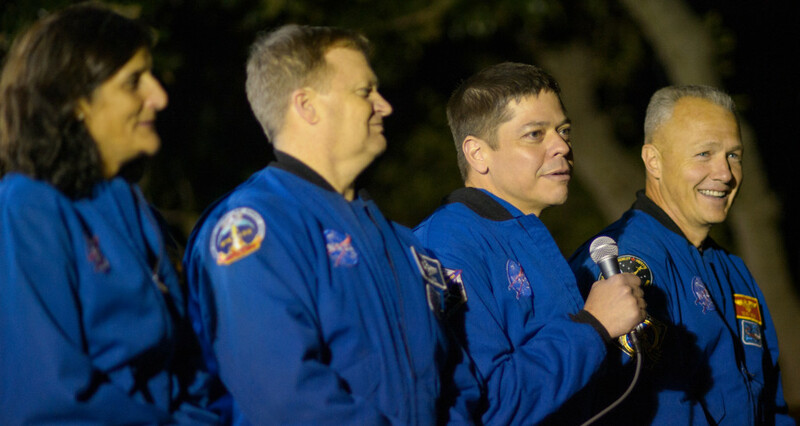 The future missions are slated to carry up to four new crew members to the station in the near future in order to allow more research to be performed in orbit and to return American launch capabilities for its astronauts. 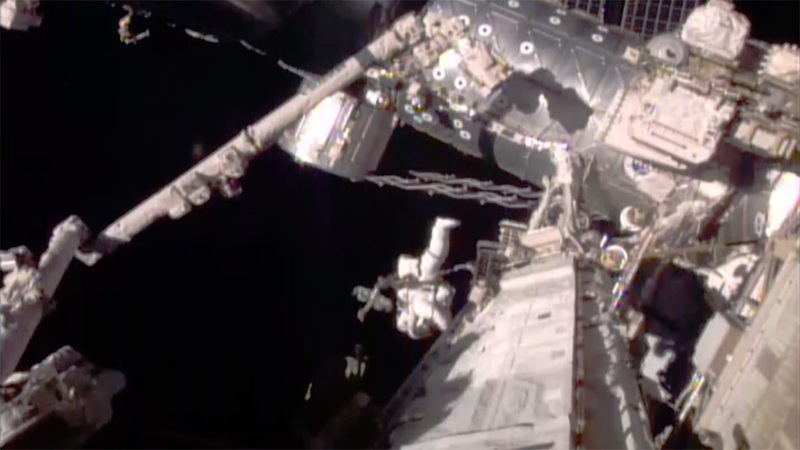 The spacewalk will begin at 8:10 a.m. EDT. You can watch it live on NASA TV and streaming on www.nasa.gov/ntv beginning at 6:45 a.m. The astronauts will return to the station’s interior at about 2:40 p.m.
Astronauts Bob Behnken and Suni Williams aren’t Marty and Doc, but they have strong views on what we should have from Back to the Future by now and what worked out well after all. Happy Back to the Future Day! 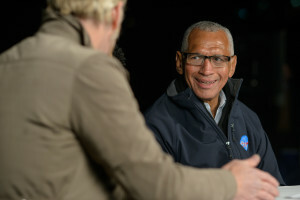 NASA Administrator Charlie Bolden, a veteran space flier, takes us inside the Astronomy Night festivities at the White House when President Obama met with the four astronauts selected to be the first to train to fly to space aboard commercial crew carriers as part of the agency’s Commercial Crew Program. You can read Bolden’s account of Monday’s star-filled night at the White House in his blog here. For more of Newman’s account, read her blog here. 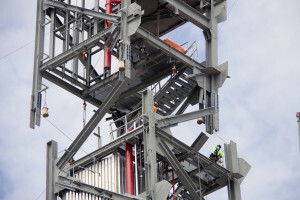 The last of seven tiers was recently added to a nearly 200-foot-tall steel structure that has changed the landscape along Florida’s Space Coast. 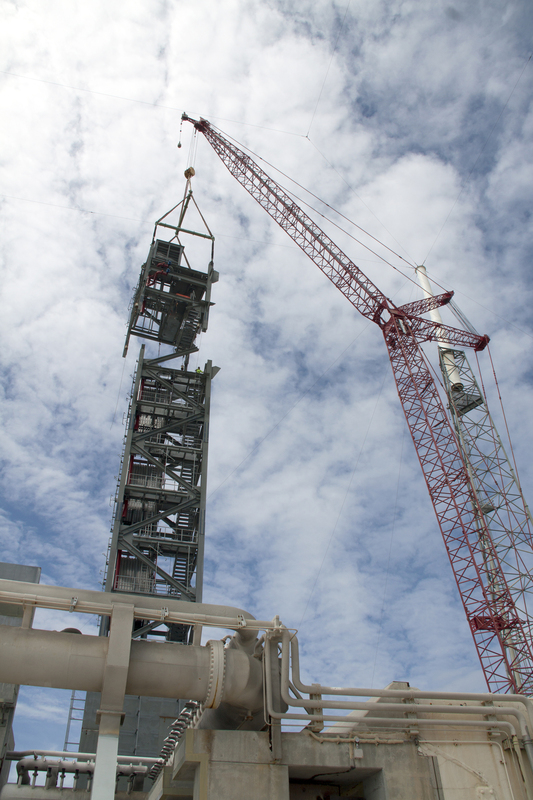 The tower at Space Launch Complex-41 at Cape Canaveral Air Force Station in Florida will provide commercial crew astronauts and ground support teams easy access to Boeing’s CST-100 Starliner spacecraft stacked on top of a United Launch Alliance Atlas V rocket at the pad. Boeing is one of two companies that will launch astronauts to the International Space Station from the United States in the next two years. These systems will carry four astronauts, increasing the station’s crew size to seven. The additional crew member will be able double to amount of time currently dedicated to scientific research. 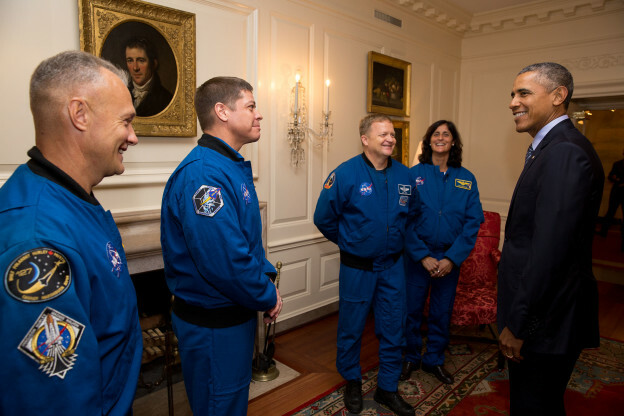 The four NASA astronauts selected to work closely with Commercial Crew Program partners Boeing and SpaceX spoke with students and teachers during Astronomy Night at the White House on Monday. 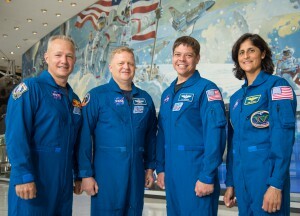 Astronauts Suni WIlliams, top from left, Eric Boe, Bob Behnken and Doug Hurley took part in a panel discussion. 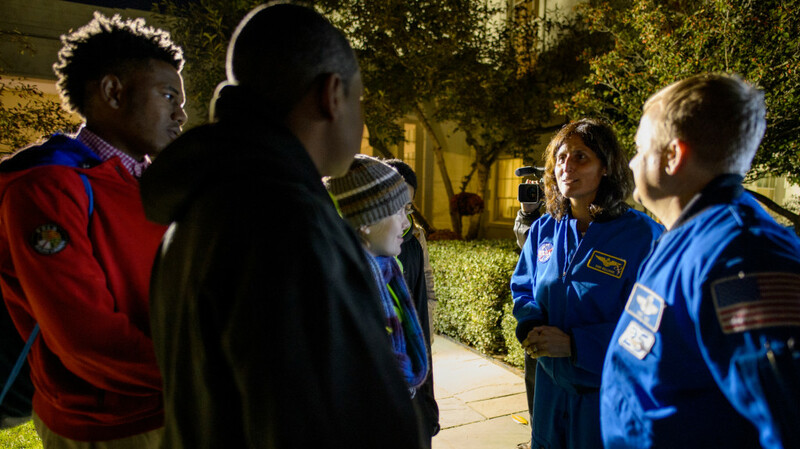 The second White House Astronomy Night brought together students, teachers, scientists, and NASA astronauts for a night of stargazing and space-related educational activities to promote the importance of science, technology, engineering, and math education. Photos by NASA/Joel Kowsky. Don’t worry if you missed this afternoon’s NASA Live Chat with Commercial Crew astronauts Bob Behnken and Sunita “Suni” Williams. You can read a recap from this afternoon’s Live Chat, at http://go.nasa.gov/1NRgSEb. You also can watch the video replay below. NASA’s Commercial Crew Program has contracted with American aerospace industry partners Boeing and SpaceX to return the capability to launch astronauts to the International Space Station (ISS) from American soil. This exciting program allows NASA to focus on deep-space exploration, while stimulating a growing spaceflight economy to low-Earth orbit. Now is your chance to ask Bob Behnken and Sunita “Suni” Williams about their selection to be among the first astronauts to train for commercial crew test flights! They are three months into their commercial crew assignments, and will answers questions live on NASA TV on Monday at 12:30 p.m. EDT. To participate, submit your questions in the comments below, tweet us @Commercial_Crew with #askNASA or post to our Facebook page with #askNASA. We’ll take questions in advance and live during the show. A new generation of human-rated American spacecraft is in development under the Commercial Crew Program that will operate safe, reliable and cost-effective transportation to the space station. 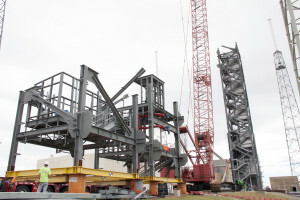 Instead of NASA designing and operating a new spacecraft, rocket and all the ground support equipment required for successful human space transportation system, the agency offered the aerospace industry a chance to apply its own innovations while still meeting NASA’s requirements. 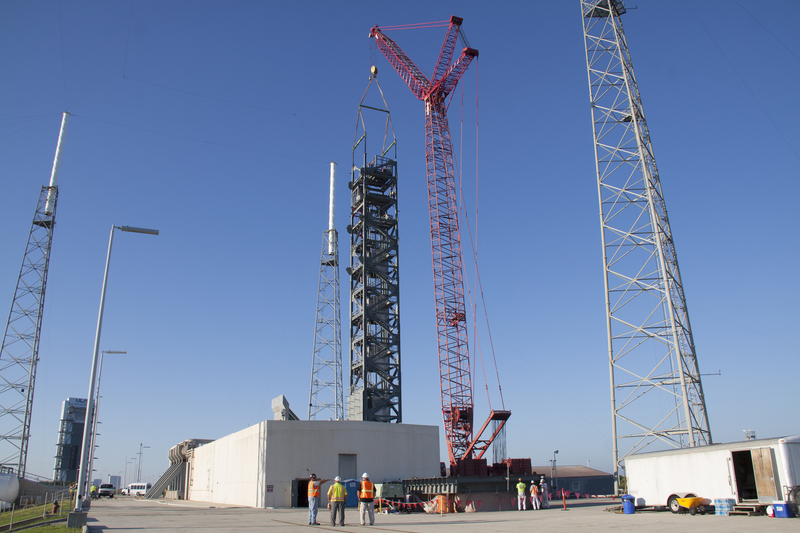 Boeing’s CST-100 Starliner spacecraft will launch on a United Launch Alliance Atlas V, and SpaceX’s Crew Dragon spacecraft will launch on the company’s Falcon 9 rocket. These systems will send astronauts to the station where they can perform more of the research that is making life better on Earth, and preparing future astronauts for missions to an asteroid, Mars and beyond. We hope you join us Monday to find out if Bob and Suni answer your question. Astronauts and ground support teams are bobbing in a unique pool in Houston to find out the best way to exit a spacecraft after coming back to Earth and landing in the water. 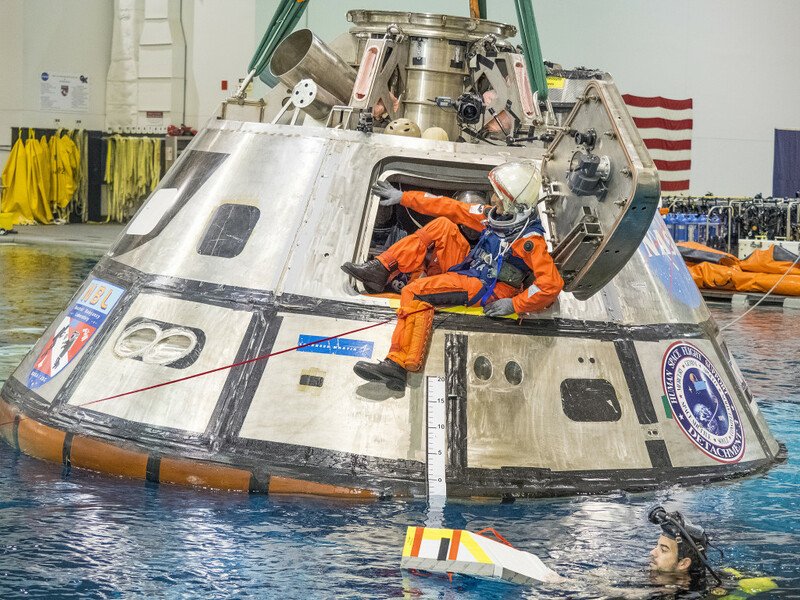 The rehearsals involve a test version of the Orion spacecraft, which NASA will use for deep space missions to an asteroid and Mars, but the evaluations also apply well to recovery planning for companies developing spacecraft for NASA’s Commercial Crew Program. The program will return crew launch capabilities from the U.S. for missions to the International Space Station. One of the astronauts training for Commercial Crew flight tests, Sunita “Suni” Williams, took part in the testing at the Neutral Buoyancy Lab where spacewalkers train underwater for their demanding work in space.